Freelancer.com’s messaging feature is equipped with text messaging, audio call, video call, and file sharing functions to facilitate a smooth communication process. All these messaging functions are enabled as soon as you accept an awarded project. For open projects that you have placed bids on, you can send text messages to the employers if they initiate a conversation with you. Read here for more details about the availability of messaging. 1. Go to the project page. 2. Scroll down to the Freelancers Awarded section. 3. Click the Open Chat button. 4. 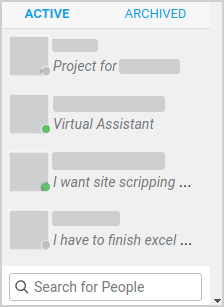 Your message thread for that project will pop up on the chat window. Freelancer.com users you have previously worked with are automatically added to your contact list. Click the name of the user you wish to chat with for your chat thread to pop up. You can also use the search field to type in a user’s name or username. ● Click on the Notifications sidebar, just above your contact list. ● From the main menu, click Messages or the icon , and click View All. ● From your Dashboard, click the Inbox tab below the main menu. On your Inbox, click on the employer you wish to chat with to open your conversation. Note: Sent messages cannot be unsent or removed from the recipient’s Inbox or chat window. Also, you will be unable to message users who have blocked you from their contacts.